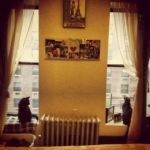 Pet-friendly two bedroom, one bathroom (roommate is NYU graduate student) sublet located in the UES/East Harlem boarder, and is walking distance from Target, Central Park, 6 train, 2-3 trains and cross-town bus. The move-in date would likely be December 8th (but is flexible), and would extend through May 1st. The apartment can come furnished or unfurnished, whichever you prefer. Hope to hear from you soon!